Wednesday 29th March saw medievalists from across the University and the city gather for the climax of the Medieval Studies calendar in Exeter. This annual day of events, generously sponsored by Prof. Nicholas Orme, has long included both a postgraduate seminar in the afternoon and, in the evening, the public Orme Lecture. This year, however, the programme was extended by an additional talk in the morning, a change that made for a packed programme of events. 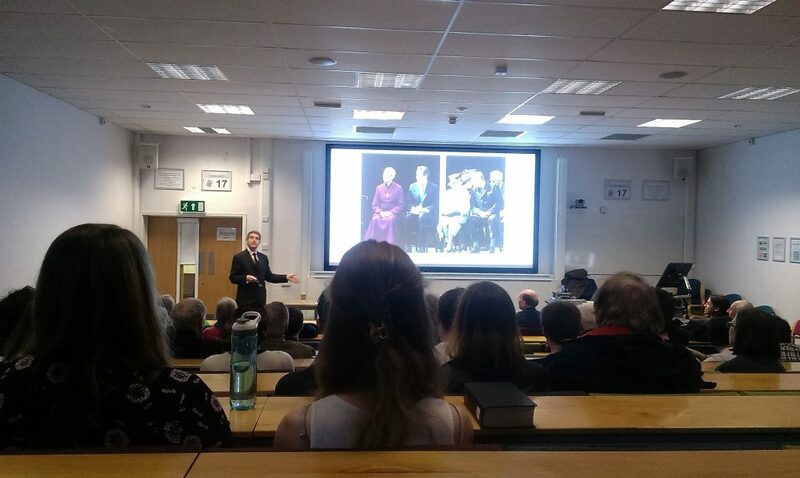 The additional talk complemented the longstanding aim of the day, which allows us to showcase some of the research being undertaken by our PhD students as well as hosting a prominent visiting speaker. The ‘Feast of Orme’, as it is informally known, is always a memorable day, but the general feeling is that this year’s ‘Feast’ was particularly intellectually nourishing. The day began with a ‘work-in-progress’ session led by Ryan Low, a Marshall Scholar studying for an MPhil in medieval history at UCL. Ryan’s unbridled enthusiasm shone through as he laid out a selection of his research questions for comment and discussion. Ryan outlined the broad aims of his project, which is centred around producing a bibliography that aims to ‘rehabilitate’ the thirteenth-century inquisitor and Dominican prior Bernard Gui. A lively discussion ensued, touching on all five ‘phases’ of Bernard’s life, while also bringing in questions of Gui’s own Occitan identity and how he would have presented himself. This ‘nerdy little kid’, as Ryan memorably described him, was to grow up to become ‘a regional actor with international clout’; in the wake of such a stimulating and thought-provoking presentation, we were all left hopeful of a similarly bright future for Ryan’s project. After lunch, our attention turned to the day’s second set of speakers, whom we welcomed as part of the afternoon postgraduate seminar. 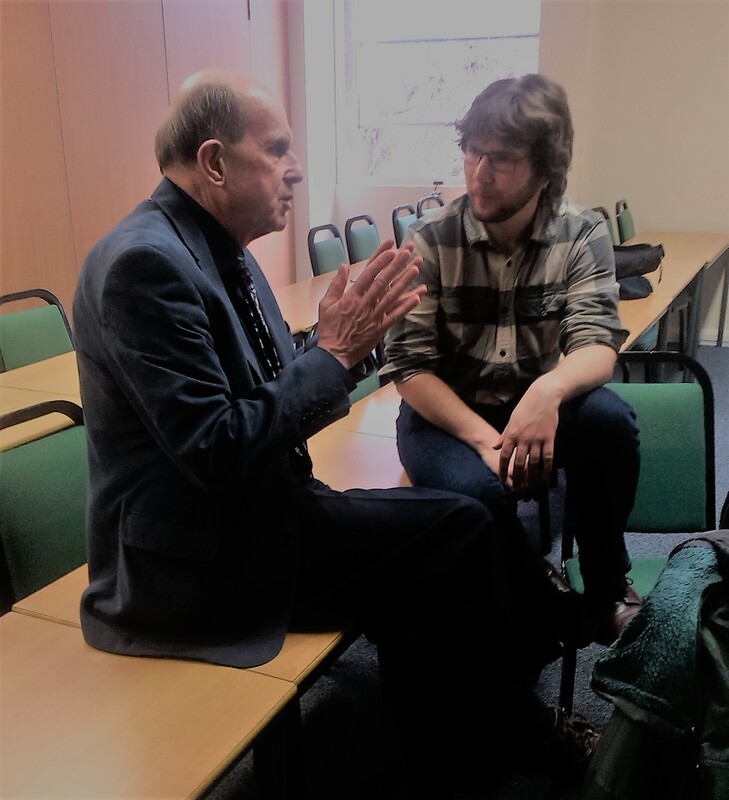 First to present was Tabitha Stanmore, one of our AHRC DTP doctoral students who is supervised jointly by Ronald Hutton at Bristol and Catherine Rider at Exeter. Her paper examined the economics of the occult in late medieval and early modern England. Drawing on an extensive range of primary testimonies from both before and after the 1542 Witchcraft Act, she demonstrated that there existed an astonishingly developed market for the services of so-called ‘cunning-folk’, with rates of payment regulated by a complex unwritten system that took into account the value of magic to the client, as well as the perceived ‘difficulty’ of the magic to perform. The system could even account for discounts being offered to repeat customers. Clearly, as Tabitha showed in her fascinating presentation, the cloak-and-dagger world of witchcraft, with its ‘introducers’ and ‘dark corners’, was far from lawless. Speaking next was Tom Chadwick, a final-year PhD student at Exeter. Tom based his presentation around an aspect of his thesis, inviting us to consider the polysemic and often-problematic term Normannitas. The term, coined in the nineteenth century in imitation of Romanitas, has been used since to present, as Tom aptly put it, a monolithic and deceptively uniform understanding of ‘what made the Normans Norman.’ The problem, Tom demonstrated, is that the multiple chroniclers writing in the eleventh and twelfth centuries defined Norman identity in different ways. Dudo of Saint-Quentin, for instance, attributed different levels of ferocity, belligerence, cunning and celerity to each successive Norman monarch, whereas William of Jumièges, writing a century later, declined to mention the former (ferocitas) entirely. The waters of Tom’s research were further muddied by the fact that still more chroniclers, namely William of Poitiers and the anonymous author of the Carmen de Hastingae Proelio, dispensed with any idea of the Normans possessing a distinctive ethnic identity at all and focused instead on their Frankish enemies and the figure of William the Conqueror. As Tom’s presentation skilfully showed, the perception of Norman identity across these chronicles is inconsistent, with Norman traits also being used to describe other gentes, and peripheral chronicles rejecting the notion of Normannitas entirely. Tom’s lively contribution elicited a wide range of questions from a room full of intrigued medievalists, and certainly proved that his talents for communicating research go far beyond re-enacting the Battle of Hastings and ‘getting ready to kill some Saxons‘. For while King Æthelstan was fighting, his sword shattered close to the hilt and exposed him to his enemies, as if he were defenceless… Oda stood somewhat removed from the fighting, praying to Christ with his lips and in his heart… [Oda] listened to the king and immediately responded with these words: ‘What is the problem? What is worrying you? Your blade hangs intact at your side’… At these words all those who were listening were struck with great amazement, and casting their glance towards the king they saw hanging by his side the sword which had not been there when they had looked earlier. Lively tales such as this one are comparatively absent from the German tradition, a curious contrast that proved to be the germ of a great deal of discussion. After a quick pause for coffee, the gaggle of excited medievalists reconvened for the day’s centrepiece: the Annual Orme Lecture. This year’s speaker was Nicolas Vincent, Professor of Medieval History at the University of East Anglia. His lecture retraced the life and the afterlife of Henry of Bracton, ‘England’s greatest medieval lawyer’. Readers with long memories may recall that Bracton has made an appearance on this blog on a previous occasion; Nicolas Vincent’s lecture, however, offered an entirely new reflection on this singular figure. Both Bracton and the book of law that bears his name have, as Prof. Vincent demonstrated, frequently been interpreted as representing a ‘quintessentially English’ strand of legal thought, with the influential Frederic William Maitland dismissing the Roman law evident in Bracton’s work as nothing more than ‘poorly-applied varnish’. By retracing the textual history of Bracton’s Treatise, however, Vincent demonstrated masterfully that Maitland’s ‘flower and crown of English jurisprudence’ was not one man’s work alone. Instead, this 500,000-word codification of English legal practice was far more likely the product of multiple voices, and almost certainly flowed forth from the minds of scholars who were far closer to the ‘thought-world of the Continent’ than that of any ‘little England’. On the day on which Article 50 was triggered here in the UK, it was refreshing to learn that, even in the thirteenth century, scholarship could be ‘a thoroughly European affair’. Medieval-, Bracton- and Europe-inspired conversation continued into the night, first at the wine reception after the talk and then at dinner in Zizzi’s in Gandy Street. It was a long and full day, but certainly the high point of this year’s medieval calendar. All of us at the Centre for Medieval Studies would like to extend our sincerest thanks to our visiting speakers, as well as to all of those who gave up their time to help make the event such a success. We now head towards the Easter vacation feeling re-energised and inspired by five truly outstanding presentations, each of which demonstrated, in its own way, the vibrance and relevance of the research connected to medieval studies at the University of Exeter. Edward Mills is a postgraduate research student in the Department of Modern Languages. On 14 October 1066 one of the most renowned battles in Britain was fought between William, Duke of Normandy, and Harold, King of England, near the town of Hastings. This October, 950 years later, I and over 1000 re-enactors from all over the world, attended the anniversary event organized by English Heritage at Battle Abbey. 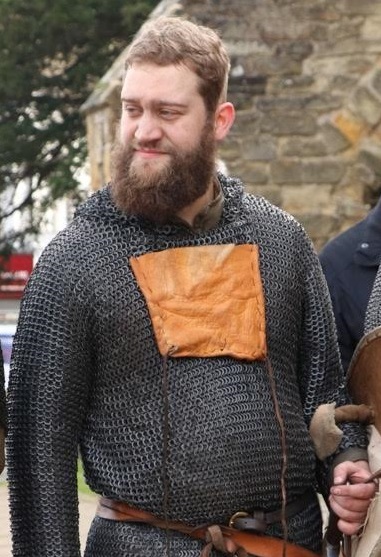 I was present as part of The Household Anglo-Norman Living History Society, a nationwide group of re-enactors who specialize in the period 1066-1216. 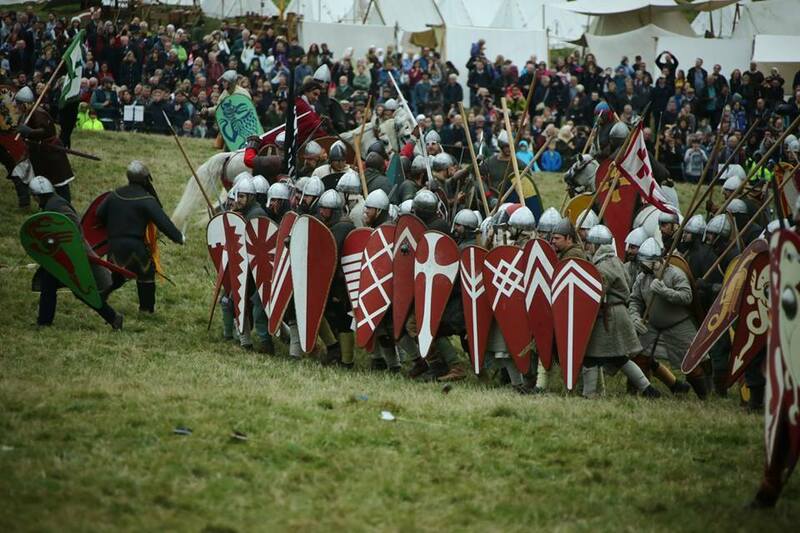 Throughout the three-day weekend event re-enactors inhabited two large eleventh-century camps, one Saxon and one Norman, displaying various aspects of ‘living history’. For example, included in The Household’s section of the Norman camp was an armoury, a fletcher’s workshop, a cooking and feasting tent, a carpenter’s workshop, a chapel, a scriptorium and several sleeping tents. The actual anniversary, Friday 14 October, had been set aside predominantly as a ‘media and dignitaries’ day and involved interviews, film crews and the culmination of the long march from York to Battle Abbey by re-enactors commemorating Harold’s hasty charge down to confront William. The Household’s camp also served as a staging ground for The One Show’s groan-worthy ‘Battle of Tastings’, hosted by Dan Snow. I also ended up on national news talking about killing Saxons – see this video: Ready to kill Saxons. The main event occurred on the 15 and 16 October and attracted at least 16,000 spectators over the two days. On each day there were various displays throughout the abbey grounds, including medieval music, have-a-go archery and the encampments. Of course, the main focus of the event was the battle itself and thankfully for those of us re-enacting the fight it lasted for an hour rather than, as is reported, the entire day. In keeping with accounts of the battle, the recreation saw the Normans sending archers, infantry, and cavalry against the Anglo-Saxon shield wall on the hill, with The Household occupying the centre-left of the infantry. The Household marching up the hill. The battle was scripted loosely around contemporary accounts, involving three attacks from each Norman contingent, two Anglo-Saxon charges down the hill on each flank, the famous, if true, piercing of Harold’s eye by an arrow and his subsequent death, and finally the slaughter of the remaining Anglo-Saxons. However, the combat itself was not scripted: although all re-enactors adhere to strict safety guidelines the combat is essentially a full-contact, competitive sport. In short, it is rather good fun! Aside from entertaining the spectators present at the event, the anniversary also garnered a lot of media attention, with rogue camera crews and journalists roaming the site asking all sorts of questions. One of the challenges of being involved in events such as this is that the nuanced nature of academic research does not always gel particularly well with those outside of academia. The public and the media aim to understand historical events in the context of their own experiences of modern, often political, events. 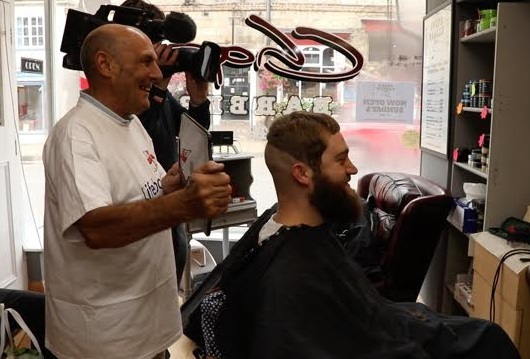 As such it was unsurprising that Brexit was a regular theme of the weekend and my work on Norman ethnicity, as well as the striking Norman haircut, marked me as a target for questions on this topic by journalists and the general public alike. While large words painted on the wall of the Battle Abbey visitor centre to the effect of ‘The Norman invasion was a good thing’ demonstrate a favourable, if blunt, perception of events, it is interesting to note how the event organizers, the public and some of the more passionate re-enactors focus on a perceived shared English identity between themselves and Harold and his troops. 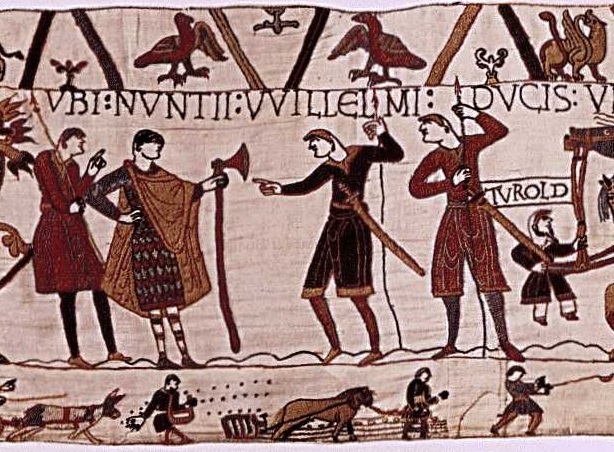 In keeping with the conquered Anglo-Saxons’ attitude to their new overlords, modern audiences see the Normans as foreign invaders; the comparisons made by some between the Normans, the EU and other groups are no doubt easy to imagine. It is unfortunate that the evident lessons concerning the continual movement of peoples and the nature of Britain as a cultural melting pot were less prevalent. 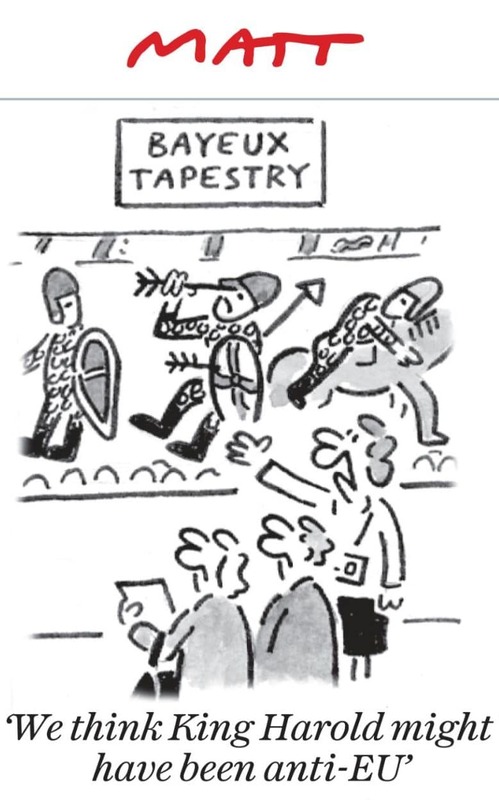 Putting politics aside, the 950th anniversary of the Battle of Hastings was a great success and immensely enjoyable. The vast majority of those involved do this sort of thing as a hobby due to their passion and interest in history, and their enthusiasm and hard work is extraordinary. For my part this tangible and experimental hobby provides a new way of engaging with the past, informing people interested in their heritage about medieval history and the opportunity to disseminate my research to a wider audience – even if, as the Hastings event proved, my message isn’t really what they want to hear! Tom Chadwick, PhD student at Exeter working on Norman ethnic identity in 11th and 12th century Normandy, England, Southern Italy and Sicily.